At a time when gardeners are still enjoying the early bulbs in the shady woodland garden, HACQUETIA EPIPACTIS also begins its long flowering period. 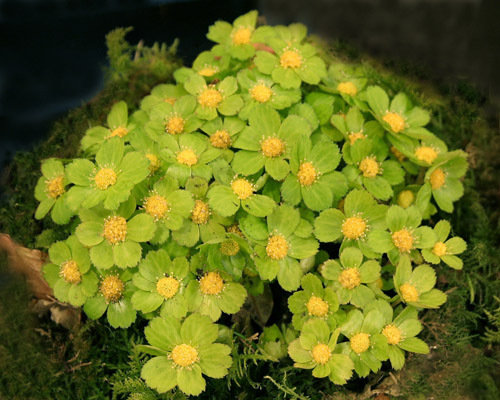 Hacquetia (umbelliferae) is a jungle species of a clump-forming perennial from Central Europe growing in mountain woods of the northern Carpathians and more eastern Alps and southern Poland. It is named after the Austrian / Slovenian naturalist and surgeon, Belsazar Hacquet. 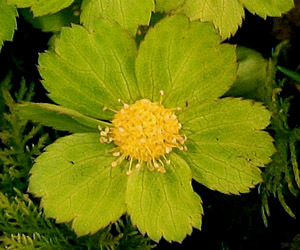 It unfurls its aconite leaves soon after Christmas, and before these leaves are fully developed the flowers open on 1-2 inch (3-5 cm.) stems. Although they have the appearance of green flowers with a broad central boss of yellow, it is the tiny flowers themselves which form the centre, surrounded by a ring of large green bracts. The flowers generally last for weeks on end until the leaves eventually lengthen and hide them. Although not a spectacular plant it is a neat, tidy and reliable perennial. It is relatively easily grown, given rich humusy soil and dappled shade. If it is happy it will seed about freely, leaving small seedlings for friends and fellow gardeners. To increase stock the clumps can be divided in late spring or early autumn.